And how about this – instead of team line ups, they called it Dramatis Personae..absolute class. To be honest that was the high point of the game. Well, there were two other incidents actually. Firstly, in the bar before the game I managed to stump Cynical Dave for only the second time with a question. Faced with a match programme from Manchester City versus Middlesbrough from 1979 he failed to correctly chose the one sole player from the twenty two listed who went on to become a manager (it was Paul Futcher who managed Darlington and Southport). 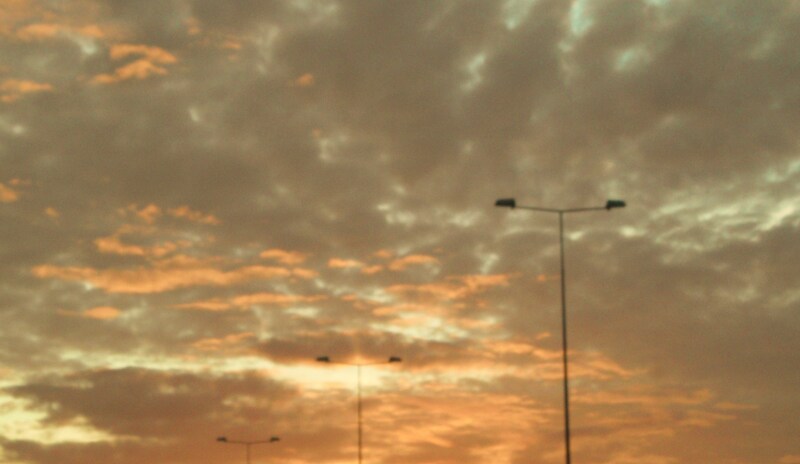 Such moments are like gold. And then we had the strange case of Tom Hutchinson. 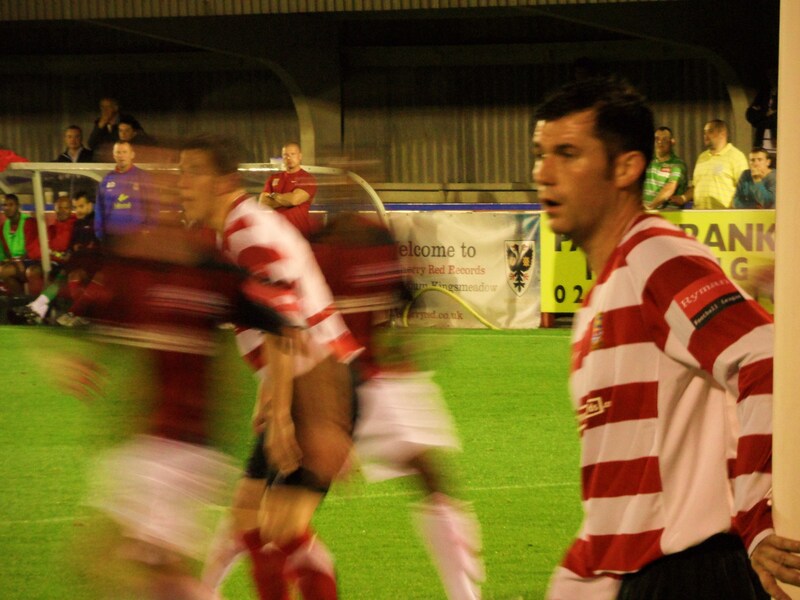 Tom was signed by Tim O’Shea, then manager of Lewes, at the back end of last season from Kingstonian. “He will do you no good” said Mr Cutteridge, but Tom was a bit of a rock at the back and our mini upturn in form coincided with his spell at the club. Now back at Kingsmeadow he was immense until the 75th minute when he was booked for dissent after questioning a handball decision that wasn’t given. The game restarted and he barely had time to walk 3 paces before he hacked down Nanetti and the referee pulled out a second yellow, 33 seconds after the first. And as he was by the touchline his walk down the tunnel would have been missed by those sneezing or generally looking in the wrong direction. Not that it helped the Lewes cause at all as they huffed and puffed but failed to blow the defensive wall down. Time can never mend, as George Michael once said, and that was so true tonight. We hate Monday night football, we didn’t want to play anyway so there! 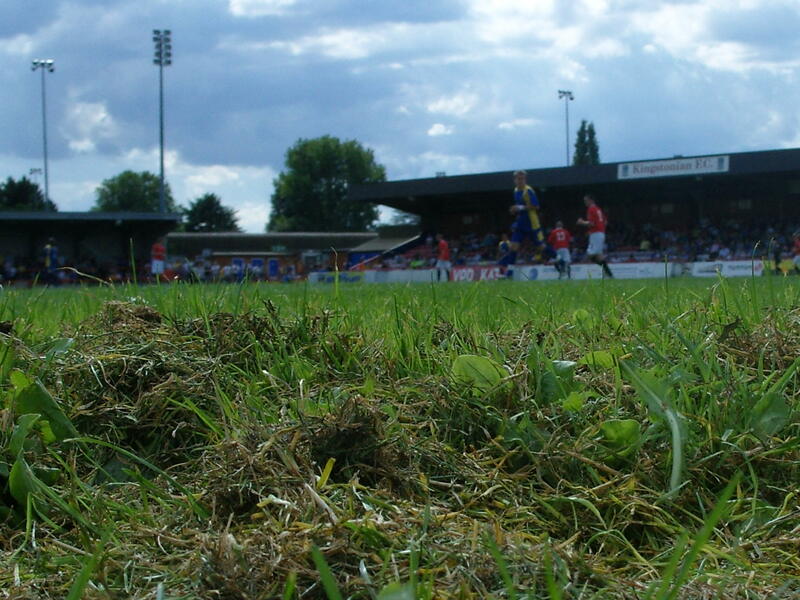 Our Last Visit – AFC Wimbledon 2 FC United of Manchester 0 – 25th July 2009 A few months ago I made myself very unpopular with a large section of fans from AFC Wimbledon in writing my blog post about their game against Hampton & Richmond. The vast majority of the abuse (and that is the only word for most of it) related to the fact that I was biased towards the home team. Despite the fact that all my blog posts focus on the home side, and that the whole point of the article was to profile the Hampton & Richmond manager Alan Devonshire, many fans took exception to the way I reported the game, and the behaviour at the end of the game of certain sections of their crowd (invading the pitch whilst the game was still on and launching abuse at a home player being carried off with a serious injury). For the record I have no issue with AFC as a club, nor their fans in general. Their rise from nothing to the Blue Square Premier League, just one step off the Football League ladder, has been nothing short of miraculous and an inspiration to other clubs who have similar values, but based on my one experience of watching them so far I found it hard to try and prepare to write something positive this time around. But what the heck. New season, new attitudes and all that. This season will be a huge test for the club. The Blue Square Premier is no pushover. There are nine clubs in the division who have played in the Football League in the past 5 years. I would say that three – Luton Town, Oxford United and Wrexham – have more cash and facilities than most of League Division Two teams. In the case of Luton they weren’t even one of the worst two teams in the league but were relegated because of anarchaic laws governing club ownership. No team had successfully made the immediate jump from Blue Square South to the Football League in one go. Last season South champions Lewes got it all wrong off the pitch (see story here) and were relegated by Easter. Eastbourne Borough had a better season, finishing in a credible mid table spot but it is not an easy transition. Not many fans, judging by my straw poll at the Market Porter on Friday lunchtime, knew about the Co-Operative SD Cup. In fact until I looked it up with a search on Google (results under the location for my nearest clinic btw), I had no clue. It is in fact the Supporters Direct Cup. A cup for those teams set up and run by fans. In the current football world where fan ownership, participation or even actual consideration is all but gone in the upper reaches of the professional game, there are two examples of clubs that have got it right. AFC and FC United. And as luck would have it both had qualified for this prestigious final. Well, not strictly true. Being the two biggest such clubs it made sense that they simply played each other and the winners got a cup and bragging rights. A bit like the now defunct Outperformance Display Trophy that West Ham competed for each year against random foreign teams but never seemed to win. This was to be the fourth such cup final played between the two. 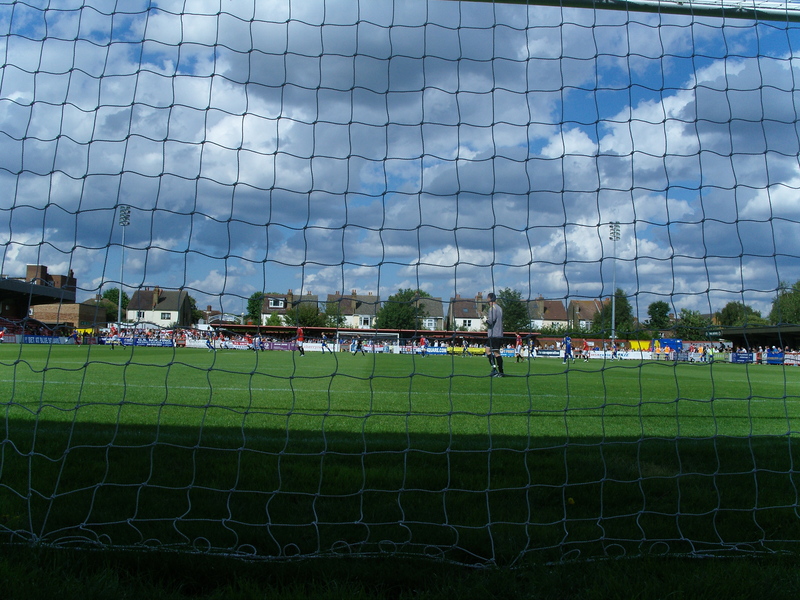 In London and the South, the rise of AFC Wimbledon has been well documented from their inception and their historic first season in the Combined Counties league in 2002, playing in front of home gates of over 3,000 at Kingsmeadow in a groundshare arrangement with Kingstonians (more than Wimbledon FC were getting at the National Hockey stadium in Milton Keynes). However, less is known of FC United of Manchester. Most football fans will recall they were set up by Manchester United fans in protest at the club’s take over by the Glazer family. They have risen quickly up the non-league pyramid and will this year try to move out of the Northern Premier League, making the step up to the Blue Square North. They also have attracted some very impressive gates, using Bury’s Gigg Lane as their home, and in fact on numerous occasions actually getting more fans than their landlords. The club have set themselves some ambitious targets including owning their own stadium by 2012 and having an average home gate of 5,000 by the end of this season. They have also invested alot of time and trouble in the local community, funding coaching programmes for fans (so that they can scout for players for the club ultimately) and have a profile of younger fans than most other clubs. So the meeting of two ambitious clubs was going to be very interesting, and meant there was more than a bit of silverware at stake. The clubs had met three times before in this competition, with AFC winning twice so FC United were certainly out for some revenge. As luck would have it Littlest Fuller had demanded her monthly visit to Chessington World of predictable rides, and being just a few miles up the road it would have been rude not to have attended this game. What surprised me was that Lolly fancied the football as well as opposed to queueing an hour for the only decent ride in the park. Fuller taxi’s dropped us off opposite the stadium and we joined in the relaxed atmosphere outside the ground in the car park with fans from both teams enjoying some rare sunshine in a very friendly environment. Tickets for the game were very reasonably priced at £10 and £3, less than half the price of the friendly at Grays two weeks ago. The club had really made an effort to put a number of activities on for the fans, including a cricket memorabilia auction and a pre match cross bar challenge. Four players from each team (well, substitutes and coaches) tried to hit the bar from the halfway line. One of the Wimbledon players managed to hit the top of the post and he won the competition by getting the closest. as the players trooped off the pitch one of the other players casually took one step and placed the ball right on top of the bar from the same distance with a shrug of the shoulders as if to say “why didn’t you ask me”. The teams came out, preceeded by Haydon the Womble who was certainly one of the most active mascots I had seen for a while. at one point he appeared with a wheelie bin which he used to try and generate an atmosphere in the main stand. The FC United fans had taken up residence in the newly expanded (well they had built an extra terrace step) east end and were generating a fair noise. In fact there seemed to be very few moments in the first half when they actually stopped singing. AFC looked the more composed team, and the two FC United centre backs never looked comfortable, or even fit at times, trying to mark last seasons top scorer Jon Main. But it was the visitors who had the first chance, when they were awarded a penalty for a clear trip on the FC United forward. 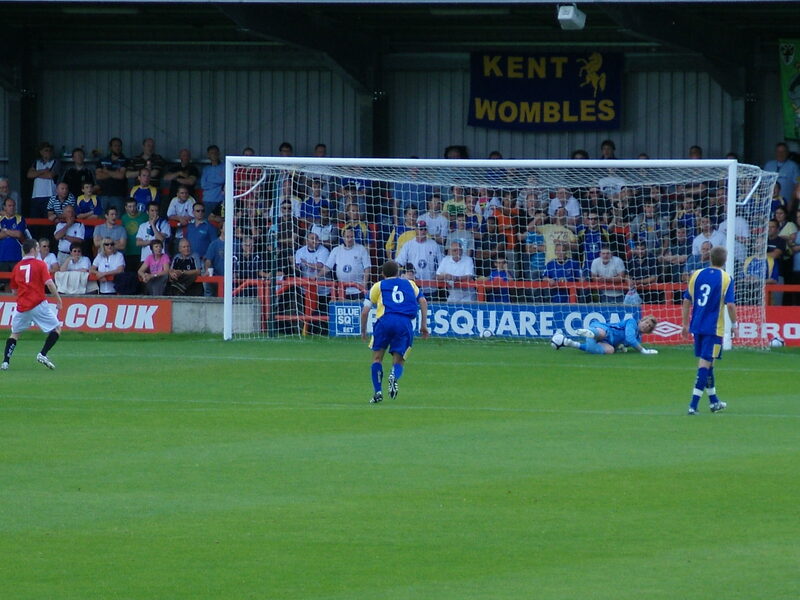 The spot kick from Adam Carden was weak and the AFC Wimbledon goalkeeper got down well and saved the penalty with his legs. That was the highlight of a first half high on effort but low on chances. In fact the closest AFC came to breaking the deadlock was a sliced clearance from the FC United centre back that had the Sam Ashton scrambling for cover. The second half saw mass changes by Wimbledon, which was obviously going to affect the pace of the game. 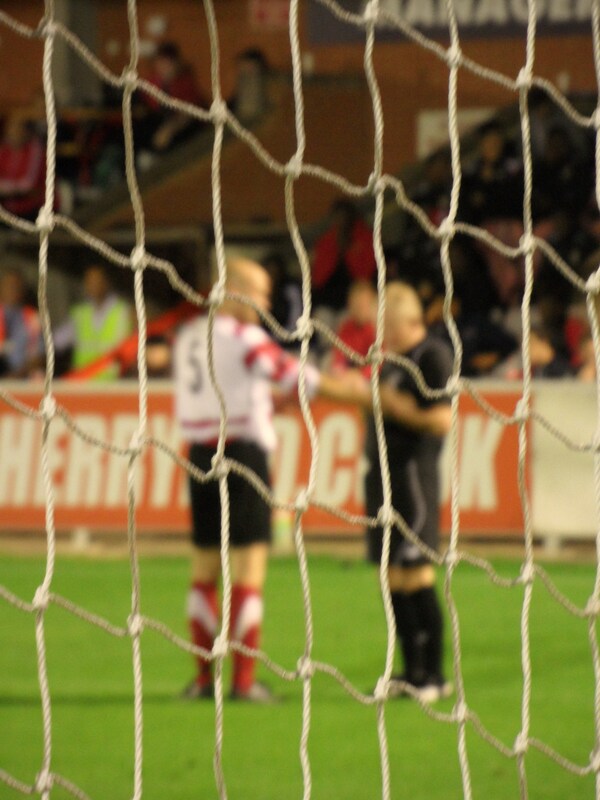 It was also obvious that some of the FC United fans had disappeared from behind the goal, perhaps to the bar? Lolly and I had a wander around the ground and met up with Jonno (one of the England passengers for last year’s trip to Paris) who was also on daughter duty, although his was suffering with teething and he was having a much harder afternoon than me with Lolly! He gave me a quick run through of the goings on at the club over the summer, being a season ticket holder who was still talking to me! Just as the PA announcer read out a crowd of 1,772 (down on the corresponding game 2 years ago but still way above average for most Blue Square teams) Wimbledon took the lead. A freekick from the left hand side was drilled across the area and at the far post completely unmarked was Ben Judge to tap home. 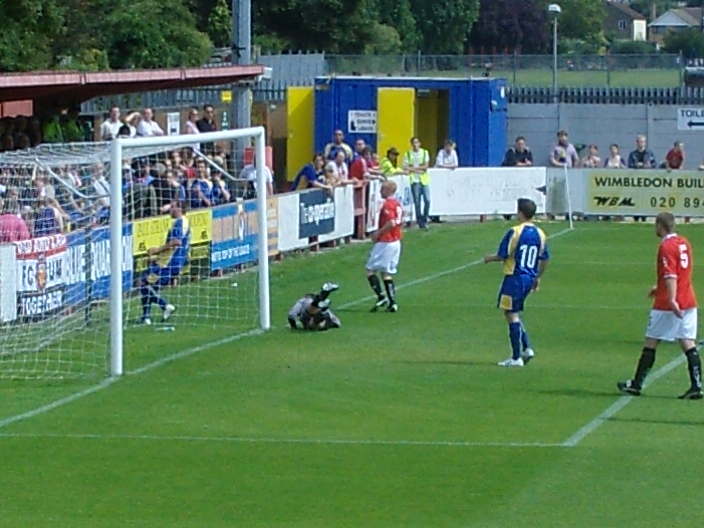 FC United tried to get themselves back in the game and Marsh hit the post with a spectulative drive. But it was always going to be AFC’s day and a second came in the final minutes as a well timed run down the right by one of the Dons substitutes allowed him time to pick his man, and triallist Peter Rapson slotted home, unmarked to win the game (Highlights of the game can be seen on YouTube by clicking here). All formalities over and the trophy back in the hands of the Dons, Lolly and I headed off to meet Fuller Taxis for our long drive down to our Dacha in the Gower and a week of relaxation, rain and maybe a couple of new games.